The Spring Equinox Bouquet is a special Spring arrangement expertly hand tied by our talented florists. 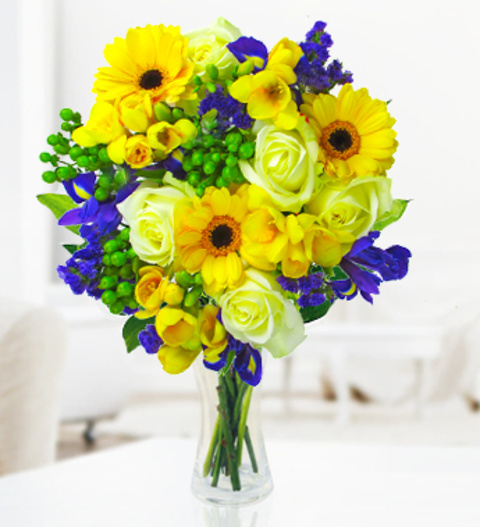 Bursting with vibrant colours the bouquet is perfect for any occasion and comes with FREE chocolates and delivery. Inspired by the fresh arrival of Spring each bouquet is arranged with Avalanche roses, sweet fragrant freesia, iris, germini flowers and hypericum. Beautifully hand tied and gift wrapped, the Spring Equinox is available for UK next day delivery. Chocolates may contain nuts.